Dr. Lynsi Clinger has been in practice since 2012 following her graduation from Life University in Marietta, Georgia. She and her husband wanted to move to Ohio and found our location, renovating and modernizing it to be a natural health center in our community. All of us are subject to physical, emotional and chemical stresses that our bodies must endure every day. Think of a simple slip and fall, playing a sport, going through birth, carrying a backpack, sitting in front of a computer all day and more. With these actions, misalignments in the spine can occur that interfere with the function of your nervous system. This system controls every cell, tissue and organ in the body. When present, a misalignment or subluxation can cause a broad range of health concerns. Dr. Lynsi’s focus is on restoring your nervous system’s optimal function so that you and your family can be active and live a more fulfilling, rich and vibrant life. Why Focus on Moms and Kids? One of Dr. Lynsi’s main focuses is providing pregnancy and pediatric chiropractic care. During pregnancy, you might feel aches, pains and get anxious when you think about the birthing process. Chiropractic can help you be comfortable throughout your pregnancy, and it’s been shown to decrease labor times and necessary medical interventions during birth. Children can avoid conditions such as asthma, constipation, ear infections, colic, ADHD, difficulty breastfeeding, developmental delay and more. Even if your child isn’t experiencing a health challenge, we’ll help make sure they stay that way! Chiropractic will keep every member of your family healthy and prevent future problems from developing. 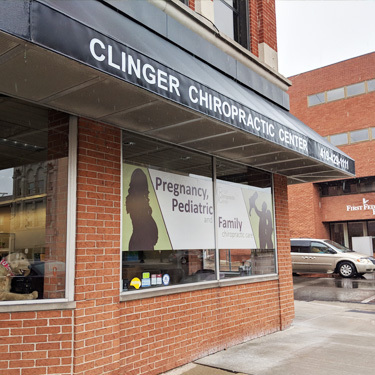 Contact Clinger Chiropractic Center today to schedule an appointment at our chiropractic office!